WARBIRDS of MARS and its Official Website at warbirdsofmars.com have been a blast for Kane and I to work on and I look forward to each new adventure Kane writes and that I can draw up and post on Fridays. Being a believer in quality over quantity, though, I don’t get new pages up EVERY Friday as stated, but I hope you all understand that I want the finished product to be as good as I can churn out at a reasonable pace. The first PRINT ISSUE Comic book of weeks 1-26 is available from Indy-Planet!! It is complete with Exclusive Intro and other extras! We have a FACEBOOK Fan GROUP! The first Warbirds of Mars 1940s-style RADIO SHOW can be heard on the Official Site, where you can also find exclusive ART, and SWAG, such as T-Shirts, Prints, Comics and Mousepads for sale!! So drop us a line and let us know what you think so far!! Can you believe it!? We’ve been creating and tweaking and prepping and drawing and writing and even more creatin’ for well over six months, now. I hope to have a better official hub site up soon, along with other cool stuff and some things that I think people will really get a kick out of. I’m also finishing another project for a comic client, so when I skip a week (or two) here or there, I apologize, but I hope to get onto a regular weekly schedule asap. Besides, I want enough pages done to collect and print for Phoenix Comic-con in May ‘11! I just wanted to take some time to point out what might not be obvious to some people; the origins of this webcomic. I’ve loved pulp style imagery for as long as I can remember, probably starting with my early enjoyment of the original King Kong (1933). 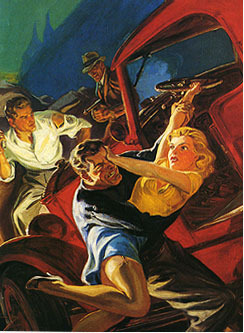 In recent years I’ve been more and more drawn to stories and art from the 1920’s, 30’s, 40’s and 50’s. I have also always been a fan of the 1953 version of War of the Worlds, and a lot of the knock-offs and B-movies – and their poster art – that followed. On a trip to Disneyland more than a decade ago (ok, maybe almost two), I walked into an art gallery and fell in love with a print of the original Alex Raymond Flash Gordon strip. His art was fantastic, and the style and layout of the comic should be evident here. 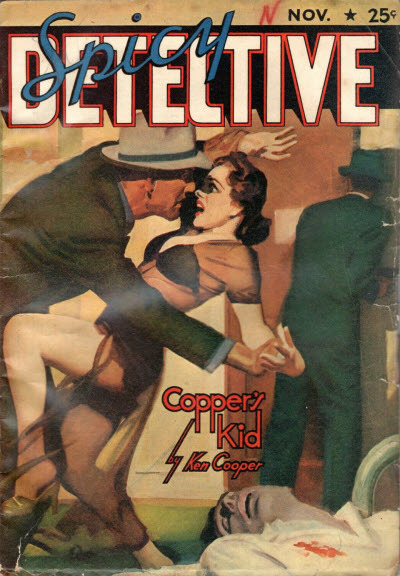 Recently I’ve discovered the comics that ran in 30’s ‘Spicy’ pulps echo an awful of lot of my interests and those of later comics, movies, and serials. Speaking of pulps. I love the covers, enjoy many of the stories (Robert E. Howard is a god to me), and am now discovering the interior illustrations as well. Norman Saunders was an amazing pulp and pin-up artist who also gave us the original, notorious Mars Attacks bubblegum cards. Fritz Lang and other Noir movie masters. When I needed to work on a new project, and this ‘Warbirds’ idea popped back up, I pitched it to Kane to write it for me. Fortunately for me, he not only jumped at it, he picked it up and ran. That’s all for now. The webcomic has Begun! Enjoy! I’m almost ready to officially unveil WARBIRDS OF MARS.. This has been an interesting ride of learning new things – both in art and in webdesign, and has ended up time consuming, but in a good way. Warbirds has a STORE! Buy our swag! I’m currently working on starting up my first self-published web-comic, so I’m in the throws (throughs? throus? forget it) of watching video tutorials about wordpress.org and such. I’m hoping I can get my page to look cool, be easy to navigate and post new pages to and get it all done in time to sit back at the art desk and keep up with my writer, who keeps emailing pages to me. Such are the trials of start-up. Example: I had just stumbled on to Blambot.com (an awesome resource, apparently) yesterday when I found that the old floppy disk I had Comicraft fonts and word-balloons on was as dead as the Sorry-i’m-a-paperweight-now PC that I had hoped to retrieve the files from. Needless to say, thank the gods for teh internet. I just spelled ‘The’ like a cat.